Miami, Florida (CNN) -- It has been 10 years since federal agents raided the Gonzalez family home in Miami's Little Havana neighborhood, seizing 6-year-old Elian Gonzalez. Today, the house is a museum where visitors can see a virtual shrine to the boy -- now a 16-year-old military student in Cuba -- and his brief time in the United States. His school uniform still hangs in the closet, along with dozens of outfits that he never got a chance to wear. His toys are on display inside the house, as well as a giant image of the infamous Associated Press photo showing a federal agent pointing a weapon toward Elian and Donato Dalrymple, who had been hiding the boy in a bedroom closet. "The story is still very vivid in this area," says Ruby Feria, a local radio reporter who covered the story. "People think that it was just yesterday that they took Elian." The custody dispute that led to Elian's seizure made national headlines, partly because of the possible impact on already tense U.S.-Cuban relations and also on the 2000 presidential election. Elian was found off the coast of Fort Lauderdale, Florida, in November 1999, the only survivor of a group of 13 Cuban migrants trying to make it to the United States. His mother was among the dead. His father, in Cuba, demanded his return, but relatives in Miami refused to release him, touching off a seven-month international custody battle. Eventually, Attorney General Janet Reno decided to send Elian back to Cuba, but she failed to persuade his relatives in Miami to relinquish custody of Elian to his father. So, during the predawn hours of April 22, 2000, armed federal agents raided Delfin Gonzalez's home and seized the boy, reuniting him with his father. Vice President Al Gore, who was running for president at the time, broke ranks with the Clinton administration, calling for the matter to be settled in Florida's family court system. Gore was accused of pandering to Florida's Cuban-American voters, because the state was a battleground state in the presidential vote. Today, largely sheltered from prying eyes, 16-year-old Elian attends a Cuban military academy in the Cuban city of Matanzas. Gonzalez, now 16, is seen in one of several photos recently released by the Cuban government. State media recently published photos of the trim-haired teen in his olive green and red uniform participating in the annual congress of the Union of Communist Youth. CNN's Shasta Darlington spoke to Elian's grandmother in his hometown of Cardenas. She said he comes home every weekend to visit his family there. "Now he's a man, a little man," said Maria Quintana, standing on the porch of the modest house where Elian used to live with his father. "He has a normal life, the way he wants it." A plaque denouncing what many in Cuba call the "Miami mafia" hangs on the front of the house. She said Elian gets top grades, but still has time for "a lot of girlfriends, just like any normal boy." Elian's immediate family has moved to another part of town to avoid outside intrusions on their life. When Elian returned to Cuba in June 2000, he and his father found themselves with front-row seats to Cuban President Fidel Castro's rallies. Castro himself had led the battle to bring Elian back. On more than one occasion, Elian himself took the stage. "It's been five years since I returned with my dad," he said at one event. 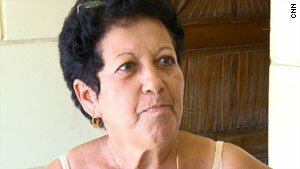 "And it was possible because of my family, the Cuban people and Commander Fidel." 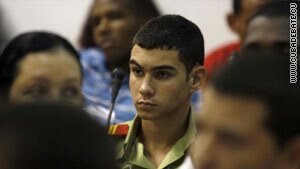 Castro and Elian also had a personal relationship. The aging president attended his birthday celebrations. Since Castro was sidelined by illness, Elian has largely disappeared from the media and public events. Cardenas -- like Miami -- has a museum honoring Elian, but it tells a different story. It features a statue of a defiant young Elian, photos and even the original T-shirt worn by one of the fishermen who found the boy drifting at sea. A sculpture of a giant middle finger reads "Cuba's answer," apparently being flipped at the country's nemesis to the north. Will it ever be possible for Elian to lead a normal, quiet life? "It's up to Elian," one of the museum tour guides said. "He could play a role in the country's future, but only if he wants to."